Ms. Flynn's 3rd Class learned about the Life of Ancient Egyptians in January. The children made fantastic displays and presented projects on topics of their choice. 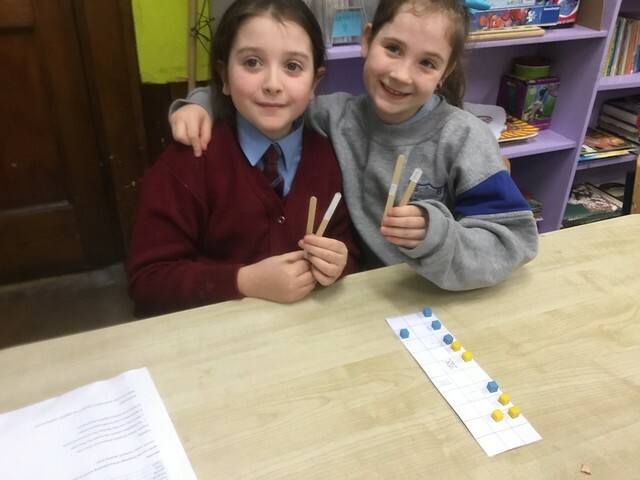 The children also learned how to play an ancient board game called Senet which uses sticks instead of dice. In addition, the children painted Egyptian masks and made colourful head-dresses for them. To finish off the children's learning of the topic, Senior classes were invited to partake in fun Ancient Egyptian activities in the classroom. Some of these activities included playing Senet, making mummies and breaking a code using hieroglyphic symbols. The children dressed up for the occasion and it was a very enjoyable afternoon.